Former England captain Alan Shearer says he is excited by Roy Hodgson's young World Cup squad and believes they are capable of reaching the semi-finals. Hodgson has named his 23 for Brazil, with Everton midfielder Ross Barkley, 20, one of 18 players under 30. "It is exciting, it has a bit of youth in it and a bit of experience. Who knows?" Shearer told BBC Radio 5 live. "England's World Cup squad contains the youth of Everton's Ross Barkley, Liverpool forward Raheem Sterling and Southampton teenager Luke Shaw but also plenty of experience. "The old guard is still represented in the shape of captain Steven Gerrard and Frank Lampard while the trusted James Milner also goes to Brazil. "Michael Carrick misses out but Hodgson could not realistically take him alongside the other veterans Gerrard and Lampard." "I think at a push we could get to a semi-final." For Shearer, key to achieving that will be the form of Wayne Rooney. The Manchester United striker, 28, has 38 goals in 89 international appearances, making him England's fifth highest scorer of all time. He is set to play in his third World Cup, but has failed to score in the previous two editions. Shearer, who will be a pundit for the BBC at the World Cup, added: "Wayne is a top player and I am one of his biggest fans. "He needs to have a big tournament for people to speak about him in the same terms as Lionel Messi and Cristiano Ronaldo and if he does do that I think England will be successful." Southampton's Luke Shaw, 18, is the youngest player in a relatively inexperienced squad that also includes Liverpool duo Raheem Sterling, 19, and Jordan Henderson, 23 and Manchester United defender Phil Jones, 22. Arsenal pair Jack Wilshere, 22, and Alex Oxlade-Chamberlain, 20, have been named despite recently recovering from foot and groin injuries respectively. Only six of the players - Rooney, Chelsea midfielder Frank Lampard, Manchester City's Joe Hart and James Milner and Liverpool's Glen Johnson and Steven Gerrard - have previous World Cup experience. Shearer added: "I think the starting XI nearly picks itself. I would start with Joe Hart, Glen Johnson, Gary Cahill, Phil Jagielka, Leighton Baines. "I would have Steven Gerrard and then either Jordan Henderson or Jack Wilshere, depending on Wilshere's fitness, in front of the back four. "The three in front of them would be Adam Lallana, Wayne Rooney and Raheem Sterling, with Daniel Sturridge at the top of that. "There's not a huge amount of expectation from everyone that England can go to Brazil and win it, but there's expectation hopefully to go there and see some progression and improvement on what we've seen in the past few years." 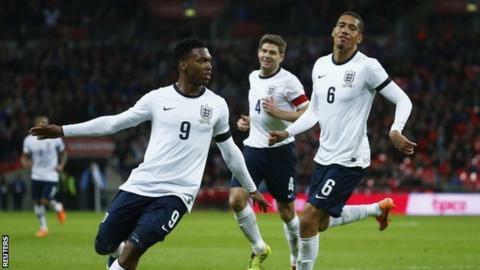 Former England striker Michael Owen says Hodgson has picked a team "for now" rather than building for the future. "Our best players are these players," said Owen. "I wouldn't look at it and think 'he's let go of a top-class ageing player in place of a youngster to give him experience'. "The likes of (Raheem) Sterling and (Adam) Lallana and Barkley, they're on merit, they're players that can affect the game at international level. "Why would you go to a World Cup just blooding youngsters?" Former England defender Martin Keown is also excited by the players chosen by Hodgson, but feels selecting some who have recently recovered from injuries is a gamble. "The youngsters give hope. They have really excited the manager and he cannot wait to work with them," said Keown. "Oxlade-Chamberlain has been out injured for a good deal of time. That's probably a gamble, Jack Wilshere as well." Owen Hargreaves, who made 42 appearances in the England midfield from 2001 to 2008, believes the youthful nature of the team will take the pressure off England. "I think with this team being so young the expectation level will be very low especially with the group being difficult - so I think that would be a positive," he said. "I think in the past we were always favourites to go on a do better and the quarter-finals was never really enough, whereas I think a quarter-final for this team would be an achievement." Crystal Palace manager Tony Pulis said: "The age and everything doesn't concern me, although he's picked some very good and talented young players. The most important thing is to get the balance of the team right and sometimes that means leaving your big players out. It'll be interesting to see the team he picks in the friendlies. "For me, the team comes before individuals. I think in his mind there will be one or two positions that have not been nailed down."